This article lists Best Free GIF Speed Changer Software For Windows. Using any of these freeware, you can easily change GIF speed. Many of these software also provide the flexibility to change display time of individual frames of an animated GIF. You can mention frame time (in seconds/milliseconds) for individual frames, and thus change the speed of GIF. Almost all these GIF speed editor software let you edit and annotate a GIF. You can transform (resize, rotate, move, etc.) a GIF, add text to it, colorize it, add effects, create drawings on it, add another GIF to it, etc. You can also edit individual frames of a GIF in many of these freeware, like remove frames, add new frames, swap frames, etc. Most of these GIF speed changer software are photo editor software. So, you can easily edit images in JPG, PNG, BMP, WebP, TIFF, WMF, ICO, etc. formats. RealWorld Paint is my favorite GIF speed changer from this list. It provides the flexibility to change the speed of the whole GIF at once or display time of individual frames of a GIF. Plus, it lets you edit a GIF and is extremely easy to use. Also, checkout the lists of best free GIF Viewer, GIF Animator, and GIF Compressor software for Windows. RealWorld Paint is a free graphics editor for Windows. It lets you edit pictures and create animations. It supports a good range of formats including JPG, PNG, BMP, WebP, GIF, etc. To change GIF speed: Open an animated GIF. Go to Animation menu > Change Animation Speed option. In a new dialog box, you will see a Speed slider which can be adjusted in 25% to 400% range to change GIF speed. You can also find Change Animation Speed option at the bottom of its interface. Change delay rate of GIF frames individually: If you want to change delay rate for each frame of a GIF separately, you can do that too. At the bottom of its interface, you will see each frame of the added GIF. With each frame, you can also see the duration of each frame in milliseconds (ms). Just click on the time and edit it accordingly. This way you can change the duration of each frame in a GIF and thus change GIF speed. It also provides a real-time preview of changes in GIF. You can play the GIF to ensure that the GIF speed is as desired. After changing GIF speed, you can save the changes in the GIF. You can also save an individual frame as PNG, JPG, BMP, or any other supported image. It also lets you edit your GIF and provides the flexibility of modifying each frame of a GIF as per your requirement. You get to add text to GIF, resize GIF, adjust color level, etc. RealWorld Paint is one of the best GIF speed changer in this list. It is an easy-to-use GIF editor and serves multiple purposes of photo editing. You can create icons using it, draw pictures, etc. GIMP is an open source graphics editor which can be used to change GIF frame rate. To change GIF speed, just open the desired GIF. Now, all of its frames will be visible in the Layers window. From this window, you can change frame rate for each individual frame. Double-click on a frame and edit its frame rate by specifying its duration in milliseconds. This way, you can customize the duration of each frame to change GIF speed. To speed up GIF, simply minimize the duration of each frame; while to slow down GIF, maximize frame duration. GIMP can also be used to edit an animated GIF. You can crop a GIF, resize it, rotate it, make color adjustment, and do more. It also provides flexibility to edit individual GIF frames as per your requirement. Just select the frame you want to edit and apply desired changes to that particular frame. To know about its editing features, check here > GIMP Review. Also, click here for a tutorial on animated GIF creation. You can preview the edited GIF by using Animation > Playback function. To save the GIF after changing its speed, use Export As option from File menu. As you click on this option, a new dialog box will appear. Enable Animation option to save the GIF. GIMP is a feature-rich image manipulation tool which lets you create animated GIF too. It supports a good range of formats, such as PNG, JPG, BMP, TIFF, SVG, ICO, WMF, etc. You can also use this software to convert WebP to GIF, create Kaleidoscope image, add noise to image, and more. PhotoScape is a multi-purpose image processor for Windows. Using it, you can batch edit photos, split an image into multiple parts, batch rename images, convert raw images, combine photos, and do more. It also lets you create animations and change GIF speed. This GIF speed changer is extremely easy to use. It provides an inbuilt file browser to access GIF folders on your PC. You can directly drop a particular GIF from a folder in its editor window. As you do that, all GIF frames with display time will be visible at the top of the window. At the right panel of the interface, you will see a Change Time button. Click on it and specify display time of all frames to change GIF speed. You can also vary display time for individual frames if you want. Just select an individual frame, click on Change Time button, and enable “Change display time of selected frame” option. In addition to above feature, you can further edit GIF by deleting a frame, changing frame position, modifying background color, adjusting alignment, resizing canvas or frame, etc. Also, you can add a photo (JPG, PNG, BMP) or another GIF to the current GIF. You can preview edited GIF anytime by using Web Browser Preview button. To save changes in a GIF, simply click on Save button. Picosmos is an image processing software which provides various tools to edit pictures, convert images, split photos, combine images, record screen, create animations, and do more. It supports various formats like PNG, JPEG, ICO, RAS, TGA, WMF, RAW, etc. This can be your another alternative to a GIF speed changer. In order to change GIF speed, you need to click on Animation tool from its main interface. Now, add a GIF from a folder using its inbuilt file explorer. The individual frames of the added GIF will be visible at the bottom of the interface. From the right panel, you can change the duration of each frame in seconds. You can also add seconds value as a decimal number if you want to add frame rate in milliseconds. To further edit GIF, you can change its width and height, customize background color, add another image as a frame, add another GIF, flip it, rotate it, etc. Click on the Play button to see the real-time preview of the edited GIF. You can save the GIF using Save as button. Chasys Draw IES is also an image processor like many other listed freeware in this list. It consists of a number of tools which let you convert images, edit images, create animations, create static and animated cursors, and more. Its tool named Chasys Draw IES Artist lets you change GIF speed. How? Let’s see. Add a Blank project. Now, open the desired GIF. As soon as you do that, you will see different windows including Preview window with GIF real-time preview, Layers window with frames and their properties, Toolbox window, Palette window, etc. To use it as a GIF speed changer, go to Animation menu and click on “Set Global Frame Delay” option. Now, you can specify frame delay in milliseconds and thus customize GIF speed. If you want to customize delay time for individual frames, go to Layers window and right-click on a particular frame and choose Properties function. In a new dialog window, you can edit frame delay for that particular frame. Apart from changing the speed of GIF, you can also edit it or its individual frames. Go to File > Save as option to save changes in the edited GIF. GiftedMotion is a portable and open source GIF speed changer software. To change GIF speed, you have to follow few simple steps. As you open an animated GIF, the individual frames of the GIF will be available on its interface. At the bottom of the interface, you can see Frame settings options. From there, change display time in milliseconds to change GIF speed. You can apply changes to all frames at once or separate GIF frames. Other GIF editing options include dispose, X Offset, Y Offset, remove frames, add copies of frames, swaps frame position, etc. You can also edit GIF by going to configure export settings button, where you can customize RGB values, dithering quality, transparent color, etc. It lets you play the preview of the GIF after editing it. To save GIF with changed speed, use its Record button. KickMyGraphics is another one of GIF speed changer software for Windows. To start with, you need to add an animated GIF. You can see its real-time preview on the interface itself. Now, use Delay slider to adjust GIF frame rate. You can vary the slider up to 1000 ms. If required, you can also enable x10 to multiple the delay value. If you want to change GIF frame rate for individual frames, you can select/deselect required frames. You can also adjust step frames and repeat times. To save the GIF, click on Make Animated GIF option. It provides other tools like animated GIF creator, screen recorder, GIF resizer, etc. Any To GIF is another free GIF speed changer software for Windows. It is one of the simplest freeware to change GIF speed in this list. Simply add a GIF and set the Delay Time in milliseconds. 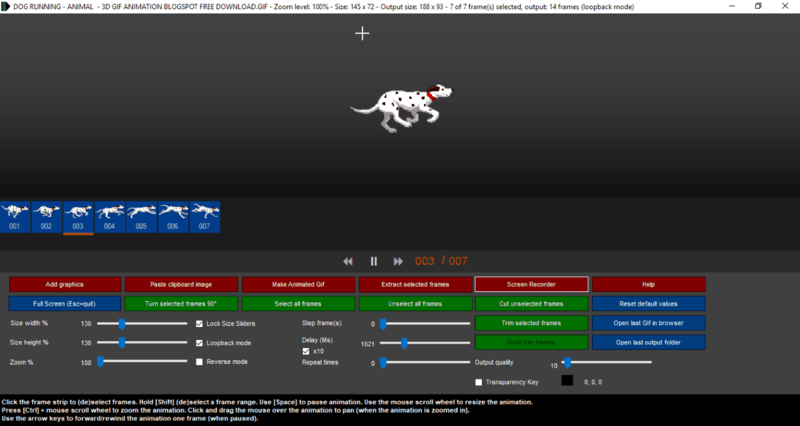 It provides the flexibility to set delay time for the whole GIF or customize it for each individual frame. After changing GIF speed, you can play its preview on the main interface. You can also change width and height of the GIF. When you are done with editing the GIF, use Save as GIF button to save it. Just add a GIF using Load Media button. After that, from the left panel, right-click on the added GIF. In the context menu, you will see an option of Adjust Speed. Click on it and adjust the speed of GIF in percentage. Now, you can save changes in the GIF by going to File > Save Video option. While saving the animated GIF using File > Save Video option, you will be able to choose output format as GIF, preset as animated GIF, resolution, etc. There is also a frame rate field which can be customized to change GIF speed. You can also edit and annotate GIF using its tools including text, object (rectangle, ellipse, clipart image, etc. ), mask, and effects (negative, noise, posterize, tint, two-tiles, etc.). The real-time preview of the edited GIF is provided on the main interface itself. Express Animate is a good GIF speed changer. It is basically a video editor. It can be used to rotate videos, resize videos, annotate videos, etc. File Converter, as the name suggests, is a free file converter. It supports a good number of file formats such as WebP, PNG, JPG, FLAC, AAC, OGG, MP3, WAV, MKV, MP4, AVI, GIF, PDF, etc. You can convert PDF to PNG, MP3 to WAV, MP4 to MP3, MP4 to GIF, MP4 to WAV, etc. This can be your another alternative to a GIF speed changer software. File Converter is a shell extension program which is added to the context menu of the supported files as soon as you install it. To change GIF speed, right-click on a GIF file and go to File Converter > Configure Presets option. A window will open where you can customize output frame per second value for a GIF. You can also rotate and scale a GIF. After saving these configurations, again right-click on a GIF and choose To Gif option under File Converter menu. If you want to customize different GIFs at different speeds, you need to reset Configure Presets. Although File Converter is an easy tool to change GIF speed, it doesn’t provide real-time preview of an edited GIF.